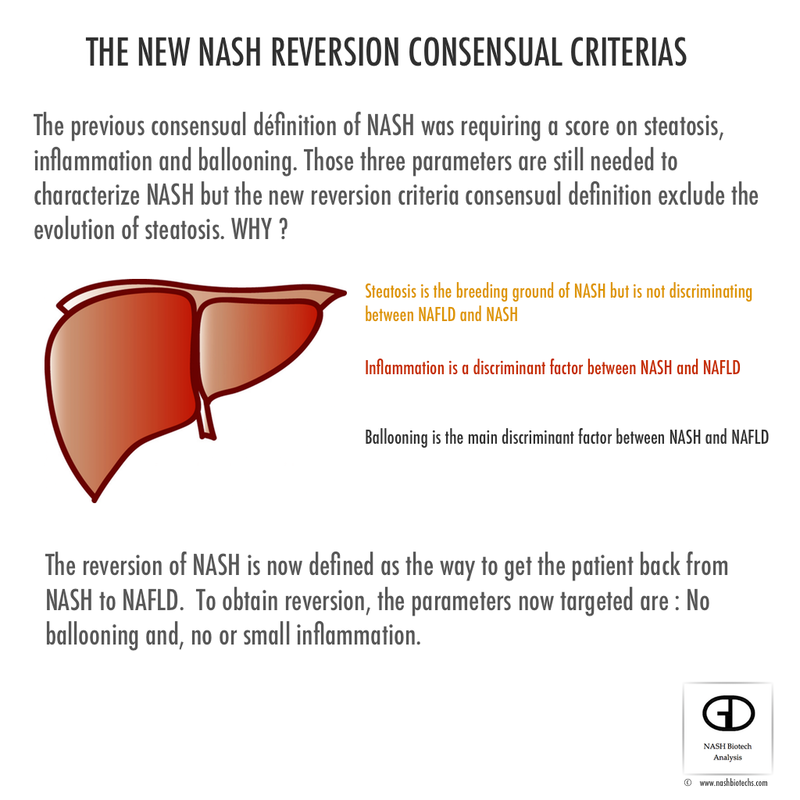 One can imagine that the new NASH consensual definition is an evolution, in fact, it's a revolution for the drug candidates on the NASH market. 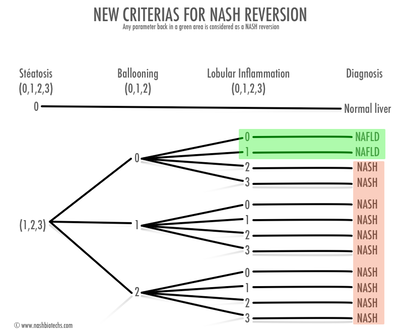 The new definition of NASH is not anymore an NAS score > 3 with a minimum of 1 in the three components (steatosis, ballooning and inflammation), it is now : on a basis of steatosis (NAFLD) any presence of ballooning (score > 0), and a minimum presence of moderate inflammation (score > 1). 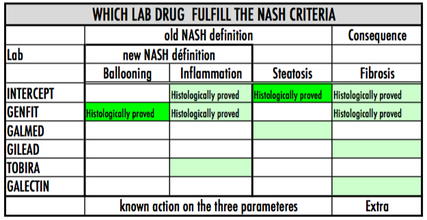 The steatosis should be present but is not anymore considered as discriminant to characterize NASH. 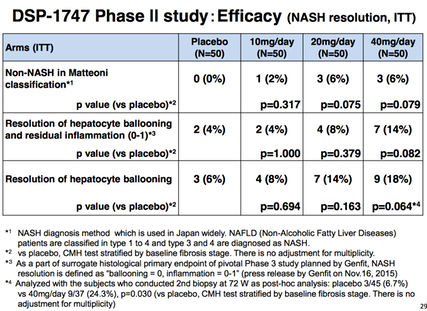 It draw a sharpen line between NAFLD and NASH which was not really the case before. 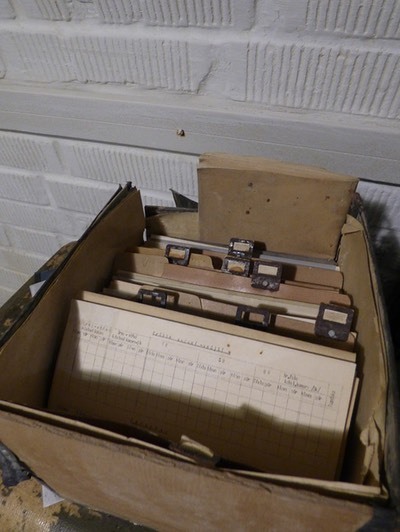 The studies show that, as steatosis reversal is quite easy with a simple modification of way of life, ballooning and inflammation are the factors to target in the pathology treatment. A simple evolution of knowledge on the disease by the specialists and the Agencies (FDA , EMA) do not seem very important, but in fact, regarding many of the laboratories in the race for proposing a drug for the NASH, it is a stoning news. 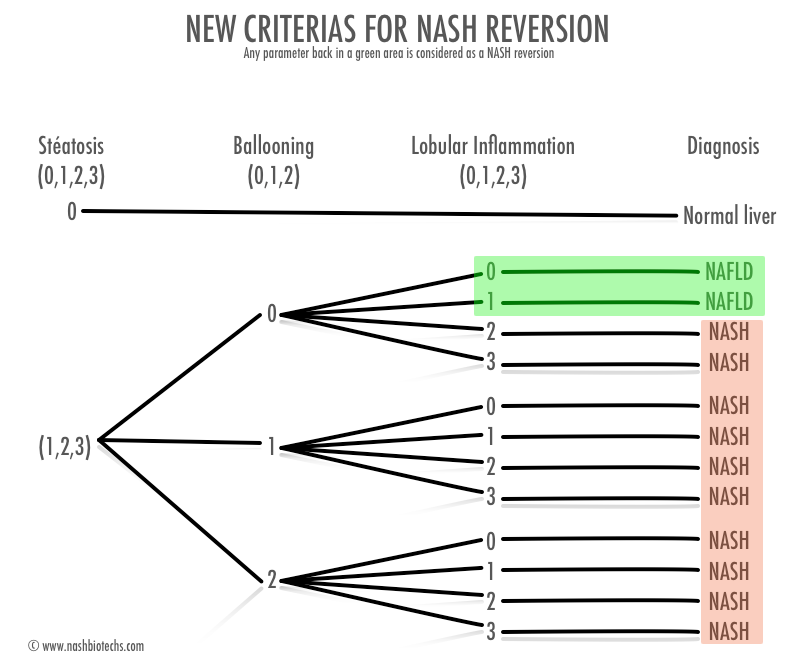 In the previous definition of "NASH reversion" you could decrease the steatosis score to 0 in a clinical trial without impacting ballooning or inflammation and then obtain a "NASH reversion", it is not the case anymore. 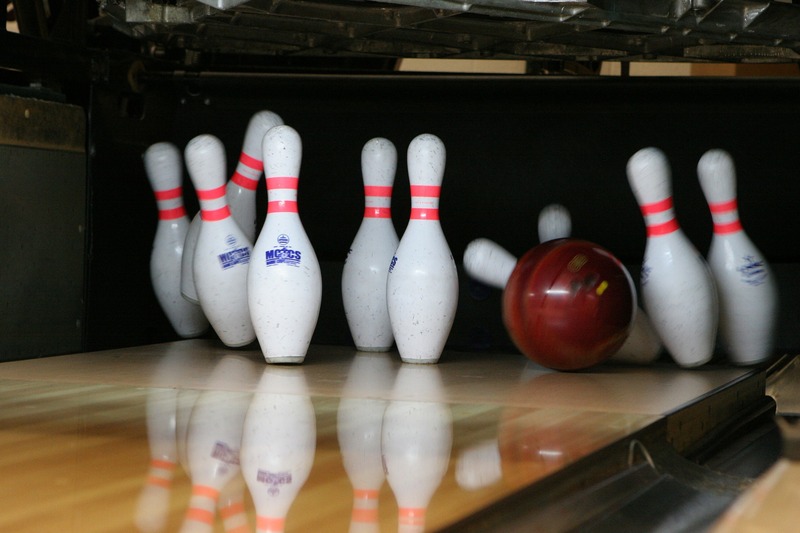 GALMED and its ARAMCHOL who target the steatosis. INTERCEPT and its OCA who proved to be efficient on steatosis in their clinical studies but not on the ballooning. 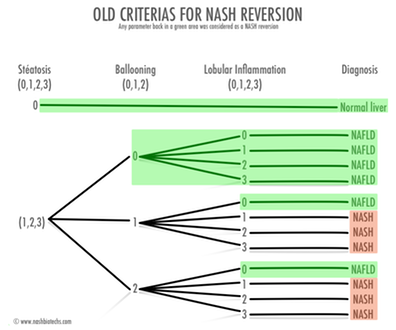 The most advanced NASH pure players who are targeting the ballooning and the inflammation, are few, in fact one : GENFIT. 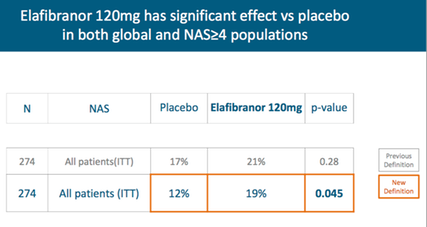 For NOVO NORDISK and its VICTORZA, they were supposed to impact mainly steatosis but at this time, without the full results of their trial, it is difficult to evaluate the impact of the new NASH définition on their results. At this time, the actors are reevaluating their clinical results in the scope ot the new reversion définition. 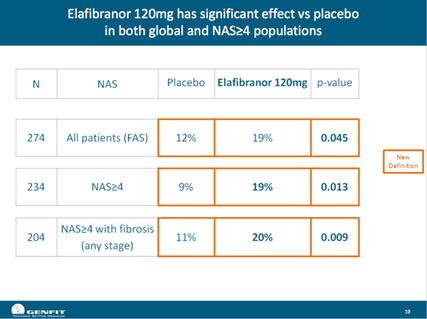 GENFIT presented the result of this re evaluation in plenary presidential session of the AASLD meeting in november 2015 and the results are a full success, the GOLDEN study show a statistical significant reversion of NASH with Elafibranor with no need to remove the NAS 3 patients as needed with the old definition.. The other clinical study screening clinical results in the scope of the new reversion definition is the Phase IIb conducted with OCA(named here DSP-1747) by SUMITOMO in Japan on NASH. The results are published by SUMITOMO in the second line of the figure below. 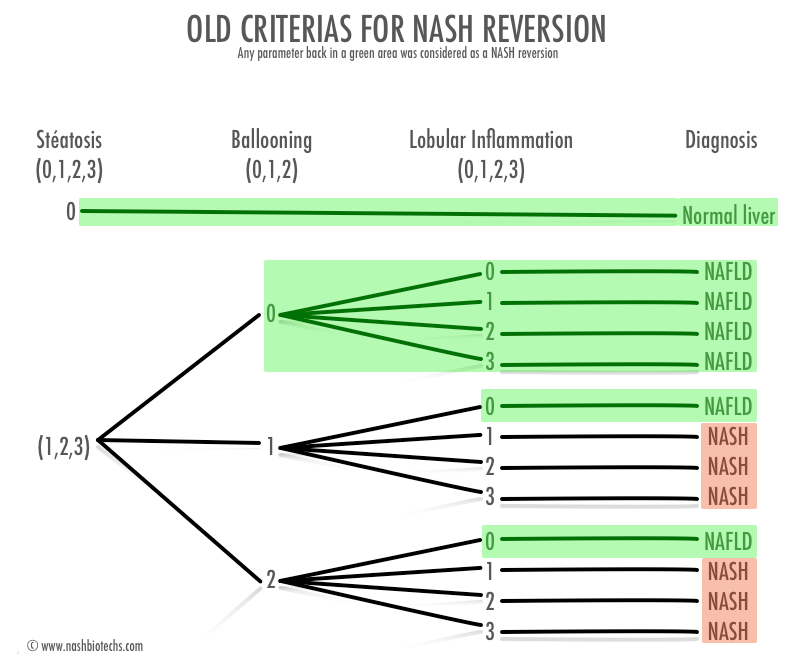 CONCLUSION : The new NASH reversion definition will strike many NASH players..